Italia is what the Italians call their country. There are a couple of theories of how Italy got its name. Originally it was spelled Vitalia, which likely stems from the Latin word “vitulus”, which means “calf-land” or “land of cattle.” This makes sense as southern Italy was rich in cattle. Another theory comes from Greek mythology, when Eurystheus ordered Hercules to bring him cattle from the monster Geryon. Just as Hercules was escaping with the cattle, a bull got loose and jumped into the sea. The bull swam to Sicily and then made its way to the neighboring country. The native word for bull was “Italos” and so the country was named Italy after the bull. Italy is located in the Mediterranean Sea and is a peninsula shaped like a high-heeled boot kicking a ball, the ball being the island of Sicily. There are many islands that are part of Italy; the largest are Sicily and Sardinia. Italy borders Switzerland, France, Austria and Slovenia. It also has two independent states, Vatican City and San Marino. Italy has a coastline of 4700 miles. Nearly 4/5ths of Italy is mountainous and hilly, with a fertile plain along its longest river called the Po. Italy’s highest peak is Mont Blanc in the Alps. It is also home to three volcanoes that have all erupted in the past 100 years; Mt. Vesuvius, Etna and Stromboli. The people of Italy are mostly Italians, with a small minority of Germans, French, Slovenes, Albanians and Greeks. The language they speak is Italian, a romance language. The majority of Italians are Roman Catholic and the church has played a large part in their lives and history. This is not surprising, as the Vatican City is located in the heart of Rome and is where the Pope resides. Italy’s topography was conducive to developing independent territories. These kingdoms did not become united until 1861, under Victor Emmanuel II, who was named the first king of Italy. 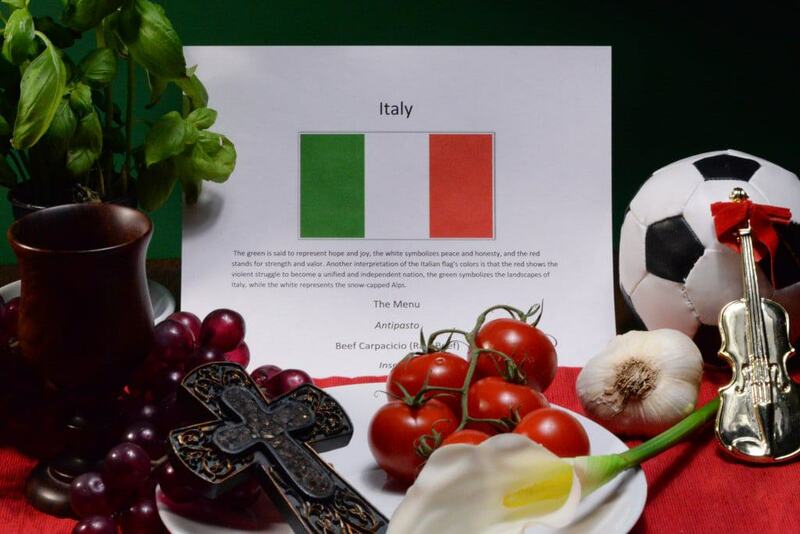 Italians celebrate their independence on June 2nd, with Festa della Repubblica, which celebrates when they were transformed from a Kingdom to a Republic, after being liberated from Nazi Germany, in 1946. Italy has a remarkable history, as they were the home of the Roman Empire which was a world power two thousand years ago. The Roman Empire lasted from 27 BCE to 476 CE in the west and continued until the fall of Constantinople (also known as the Byzantine Empire) in 1453 CE, in the east. Its tentacles reached nearly all of Europe, Egypt and along with the north coast of Africa, stretching 2.3 million miles. Nearly one in four of all people, during this time, were ruled by the Romans. The inventions and innovations that were generated during this time continue to be used in cultures around the world today. Some believe it was the most important time in history. It is hard to say what the Romans invented on their own or what they simply expanded upon, but there were many innovations. Advancements in roads and buildings, indoor plumbing, and aqueducts, apartment complexes, public toilets, locks and keys and even shoes, socks, and cosmetics are just a sampling of their contributions to society. The western calendar, including the names of the days of the week and months, was created by Julius Caesar. They also made improvements in the fields of medicine, warfare, law, and government; a legacy which continues to affect the way we live today. Italy has more masterpieces per square mile than any place else in the world, which is why it is the country with more UNESCO world heritage sites than any other country. Italy attracts over 50 million tourists per year and tourism constitutes 63% of their national income. Rome, also known as the “Eternal City,” is the capital of Italy and home to so many amazing treasures: the Sistine Chapel in the Vatican, St. Peters Basilica and its famous dome, the Colosseum, seating 60,000 spectators who would watch chariot races and gladiators battle to the death back in the early first century and there is the famous Trevi Fountain, where tourists drop 3000 Euros worth of coins in the fountain every day, as they make a wish. (The coins are collected daily and given to charity to help the poor.) There is also a sophisticated system of aqueducts that provided water to the ancient city and mysterious catacombs, which are underground Roman burial grounds. Rome is the most popular tourist destination in Italy. The city of Florence, considered to be the birthplace of the Renaissance, is located in central Italy. This beautiful city is filled with museums, monuments and artwork from many of the greats like Michelangelo (creator of the famous statue of David), Botticelli and Da Vinci. Many works are housed in the Uffizi Gallery, opened in 1560; one of the oldest museums in the world. A spectacular UNESCO site in Florence is the Duomo di Firenze, also known as the Cathedral of Saint Mary of the Flowers. Its construction was begun in the late 1200s and not completed until mid-1400s. A dome, larger than ever before constructed, was an engineering marvel and completed long after the other structures of the Duomo but before the structural calculations for its success even existed. The façade of this amazing complex is made of green and pink marble, outlined in white. It is absolutely stunning! Florence is considered the capital of the Tuscany region of Italy. Tuscany is famous for its spectacular landscapes, with rolling hills and fields of flowers, which has been the inspiration for many of the great artists. The region of Tuscany reaches from the Apennines to the Tyrrhenian Sea. It comprises ten provinces, including Pisa, home to the famous leaning tower that tilts 14 feet from perpendicular. Medieval villages, historical towns, castles, country churches and abbeys dot the landscape throughout the region. It is also home to Chianti, famous for their vineyards and olive groves. Venice is another spectacular city located in the northeast, founded over 1500 years ago. It is a city that is famous for its art and architecture but mostly for its unique system of 118 small islands separated by canals and linked by bridges. The canals work as the roadway for transportation. Gondoliers, dressed in boldly stripped shirts, will gladly take a tourist to their destination gliding in a lushly appointed gondola, decorated in crushed velvet and Persian rugs while playing romantic, Italian music. The whole city is a UNESCO site and there, one of the most eminent spots, is St. Mark’s Basilica. Venetians, known for their Carnival and Masquerade balls, (where pretty much anything goes), is also celebrated for their film festival that attracts the rich and famous from all over the world. Venice does face challenges, as it is sinking and prone to flooding. It is quite an experience to hear the sirens sound and watch workers frantically construct an above ground walkway all along the main canal. Fashionable rubber boots for women are common attire in Venice, as it floods about once a week. The bottom stories of most buildings have been abandoned due to its sinking shores, yet Venice remains one of the most attractive tourist destinations in Italy. Milan is considered to be the main industrial, commercial and financial center of Italy. Also rich in history with museums, theatres and cathedrals (one of which houses Da Vinci’s, “The Last Supper.”) Milan is considered to be one of the best fashion and design capitals of the world; presenting two full weeks of fashion shows with collections from Valentino, Prada, Gucci, Versace, Armani and Dolce & Gabbana, to name a few. Milan is also known for hosting the World Cup in 1934 and 1990. 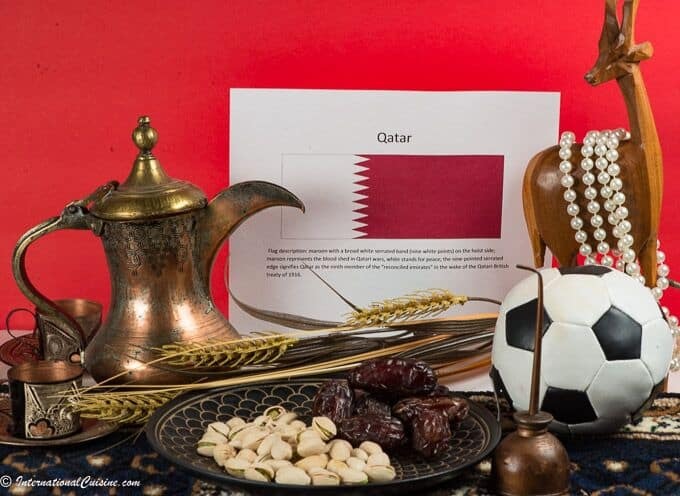 Soccer is considered to be the national sport. Italy has won the World Cup four times, just behind Brazil. Soccer fans are called “tifosi” meaning “carriers of typhus.” They are known for their rowdy behavior and lack of inhibition. Milan also just put on EXPO 2015; the World’s Fair. The theme of the fair was “Feeding the Planet, Energy for Life.” It was the first time food was the theme of a world’s fair. The Expo, included pavilions from 145 countries around the world, where one could get a taste of each country’s cuisine. As we look into Italy’s cuisine, they like to say they taught the rest of Europe how to cook. If you ask an Italian where is the best place to eat? The likely reply will be, “my mother’s house.” Each region and province have their own specialties and the cuisine is extremely diverse. From a culinary standpoint the region Emilia-Romagna is considered to be the “food breadbasket “of Italy. It is home to Parma, famous for the cheese Parmigiano-Regiano and prosciutto, but that is just the tip of the iceberg. They are also famous for Aceto Balsamico Tradizionale di Modena (balsamic vinegar certified and aged for 12 years) truffles, chestnuts, salume, raw seafood, called crudo, the real Bolognese, and fantastic wines. Italians love food. They don’t view it as nourishment, they view it as life itself. Meals in Italy are savored, over a long period of time, enjoyed with family and friends and of course a lovely wine. Family is an extremely important value in Italian culture. Perhaps this is why treasured recipes are passed on from generation to generation. Italians are known for using the freshest ingredients, which lets the flavors of the food shine through. They are also masters of using leftovers; nothing goes to waste. Many recipes are simple, with just a few ingredients and, unless you are making pasta dough from scratch, they are pretty easy to make. Italians use garlic, oregano, parsley, thyme, sage, basil and of course olive oil to flavor their dishes. Italian cuisine has to be one of the most exciting and delicious in the world. There is so much to discuss regarding Italy’s cuisine. Take pasta for example, they have over 400 types with over 1300 names. It is used in one of three ways. First, fresh or dried pasta is cooked in boiling water, and then mixed with all a variety of pestos, sauces and toppings. Another way pasta is enjoyed is called “pasta in brodo” which means “in broth” making delicious soups. The third way, is pasta “al forno” or pasta that is cooked twice. First the pasta is undercooked in water to soften it and then baked in the oven, with any array of meats and sauces, like their world renowned lasagna. Cheeses of all types are made in Italy and represent very regional flavors. Cheese is made from the milk of cow, sheep, goat and water buffalo. The flavors of the cheese have much to do with what the animal eats, which of course varies with region. Needless to say, they make fabulous cheeses. Here are a few of the popular types, but there are over 300 different kinds: mozzarella, ricotta, burrata, mascarpone and of course Parmigiano-Reggiano, which is a staple in every Italian household. There are plenty more commonly used in Italian cuisine, some of the more popular are gorgonzola, pecorino, provolone, and fontina. Italy is a cheese lover’s paradise. Pizza is another prized dish in Italy. Flavored and topped flat breads had been around for ages, and focaccia, a type of bread that originated in Genoa may well be the precursor to modern day pizza. 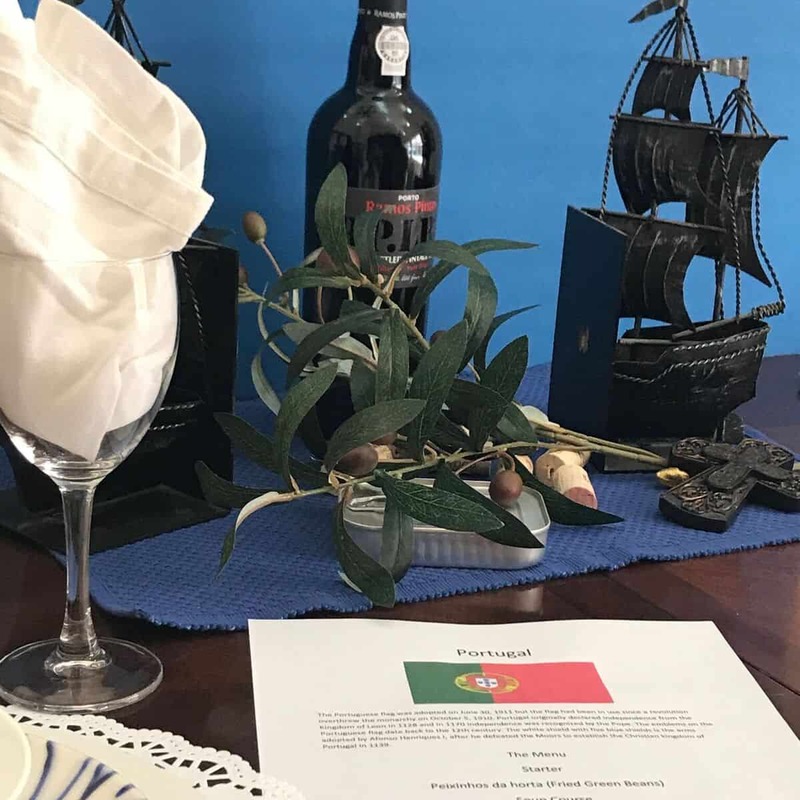 However, it was in 1889 when the Queen of Italy, Margherita di Silva, was vacationing in Naples and heard about the excellent pizzas made by Raffaele Esposito. He created her a special one, representing the colors or the Italian flag, with tomato, mozzarella and basil and she loved it. The pizza, which now bears her name as Pizza Margherita, made history. Today, modern day pizzas are topped with everything imaginable. To be a true pizza however, it needs to be cooked in a wood burning pizza oven. Pizzerias are found all over Italy. In trying to pick a menu for Italy, I was completely overwhelmed. There are way too many delicious choices, so I decided to simply make some of my all-time favorites. We began our Italian meal with the sounds of Luciano Pavarotti, (Did I mention music and opera are also world famous in Italy? They also have the distinction of having made the first violin, viola and cello back it the 16th century.) Luciano, even after his death, is considered a celebrity and is one of the best tenor voices in the history of opera. The first course of an Italian meal is called antipasto; an appetizer course to set the stage for the meal to come. Carpaccio is a dish of thinly sliced, raw beef or raw fish, and is for sure an all-time favorite. 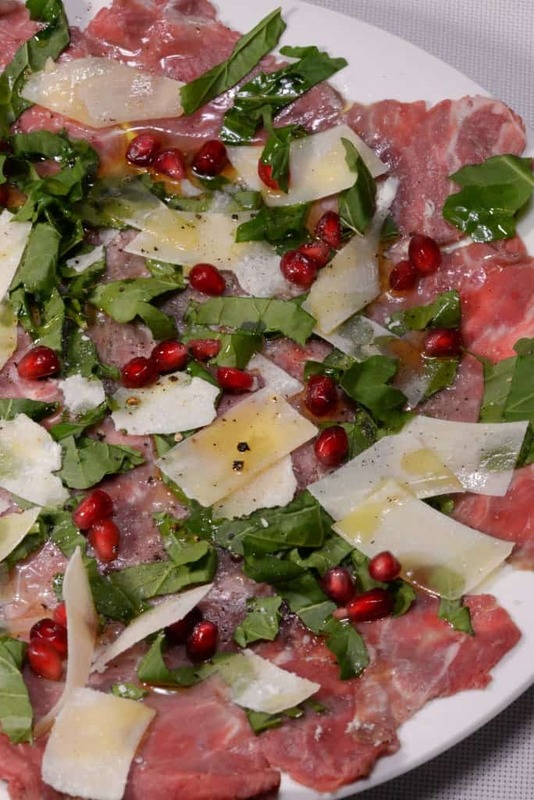 This one was made with beef tenderloin, topped with fresh arugula, pomegranate seeds and shaved Parmigiano-Reggiano, then dressed with olive oil and lemon. HEAVEN! Next. was a caprese salad. Caprese means “in the style of Capri.” Capri is a beautiful island off the coast of Naples and is where the salad originated. This salad also has the colors of the Italian flag. 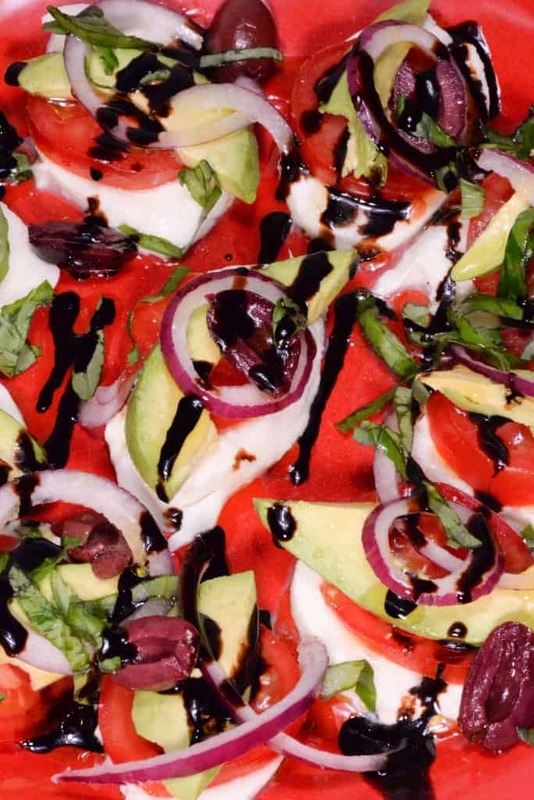 It is typically made with buffalo mozzarella, tomatoes, and basil, drizzled with olive oil and balsamic glaze and seasoned to taste. The key is to get the freshest ingredients possible. I like to add fresh avocado and red onion which makes this one of my most requested dishes. The other secret, is to use a balsamic reduction glaze as opposed to regular balsamic. Deliciouso! For the main course, we had an amazing veal scaloppine dish, called Veal Estensi. 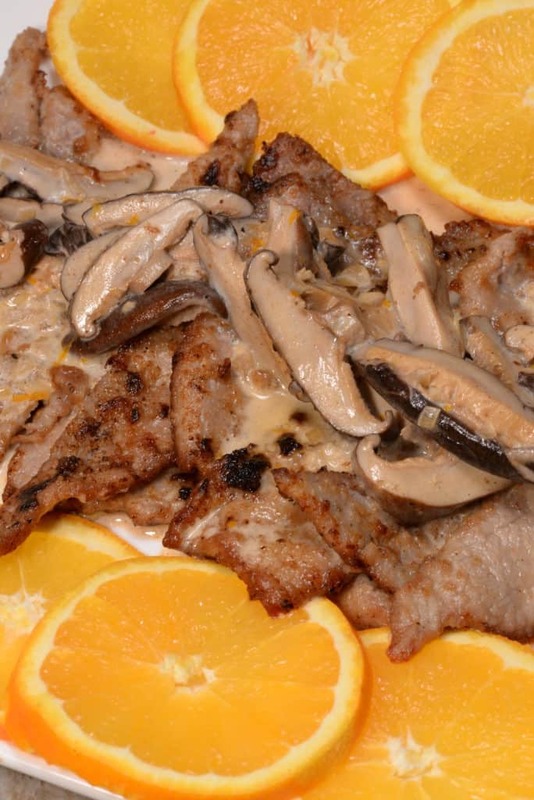 This dish is made with thin slices of veal topped in a cream sauce with porcini mushrooms, Madeira wine and a hint of orange. 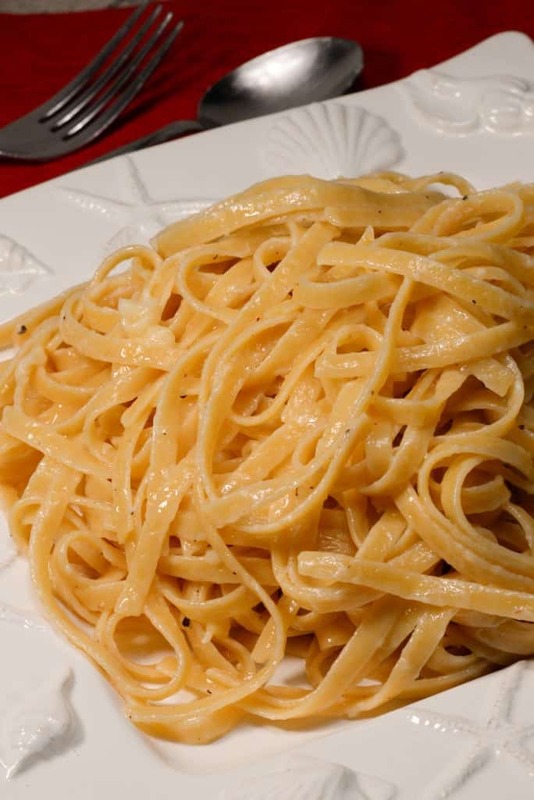 It is served over fettuccine in the style of Alfredo, (which is simply butter and cheese, not the creamy, American version) and was the perfect accompaniment. 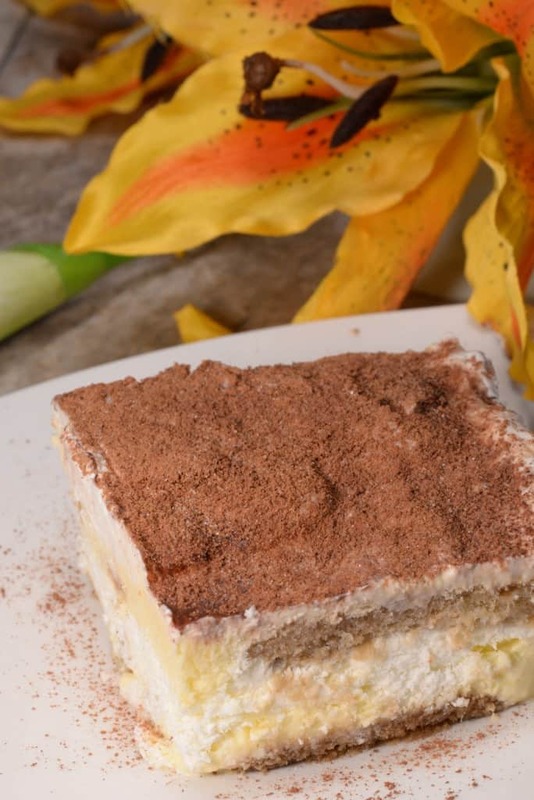 For dessert, or dolce, as they call it in Italy, we enjoyed tiramisu. If I am going to splurge on a dessert, this one is always at the top of the list. It is a light, layered sort of creamy cake with a hint of coffee flavor. It is very difficult to describe other than to say, it’s magical. 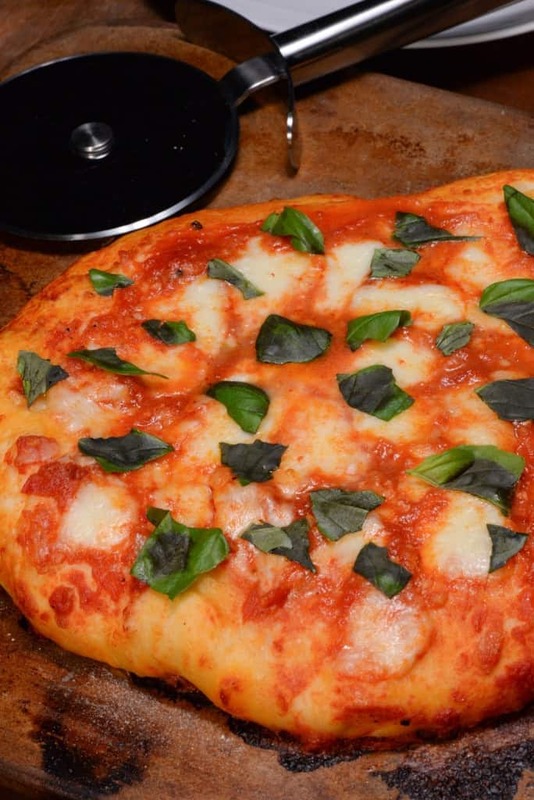 Pizza Margherita is made from pizza dough created from scratch. This was quite the experience for me, which you can read all about in the recipe. Despite the drama, it came out excellent! 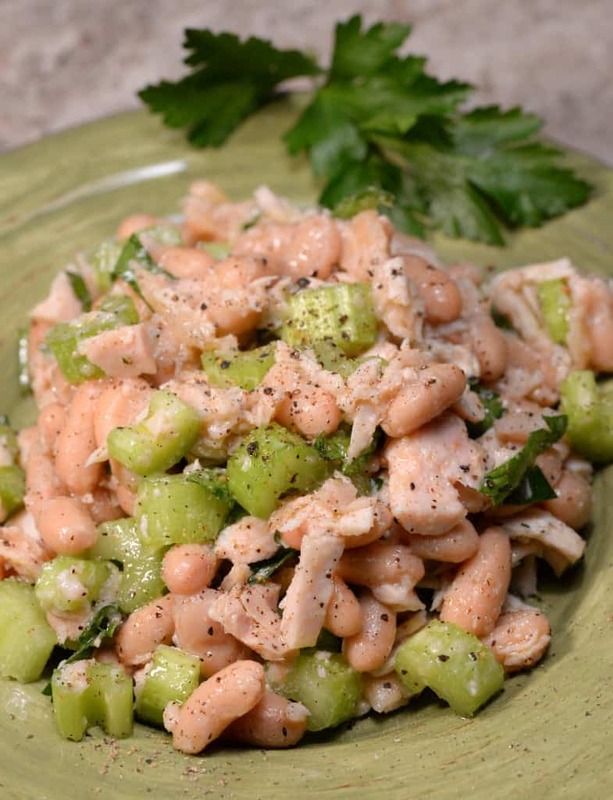 Another one of my favorites, is a salad called “insalata di tonno con cannellini.” This super easy recipe has just a few ingredients and makes a lovely side dish or lunch. It is simply: canned tuna, white beans and celery, chopped Italian parsley, drizzled with extra virgin olive oil, salt and pepper to taste. So simple, so Italian! “Life is too short, and I’m Italian. I’d much rather eat pasta and drink wine than be a size 0.” Sophia Bush. I can’t wait to have that problem! I am hoping walking around all those museums will help!